As with all restorative poses, our aim is to feel grounded enough to fully relax and release tension. I invite you to practice the pose of the month for 10-20 minutes / day. Even per week is fine. While restorative poses look easy, that doesn't mean they are. It can be difficult to really relax and remain silent with your breath for 20 minutes! Thoughts aren't so easy to let go of. Judgments may enter wondering what the point of this is. If you find yourself having difficulty start with 5 minutes and slowly allow yourself relaxation. Conscious relaxation. The need to strive and drive keeps us in flight or fight. We need deep relaxation to reverse the damage on our nervous systems. Props: Two blankets folded rectangles. A chair. 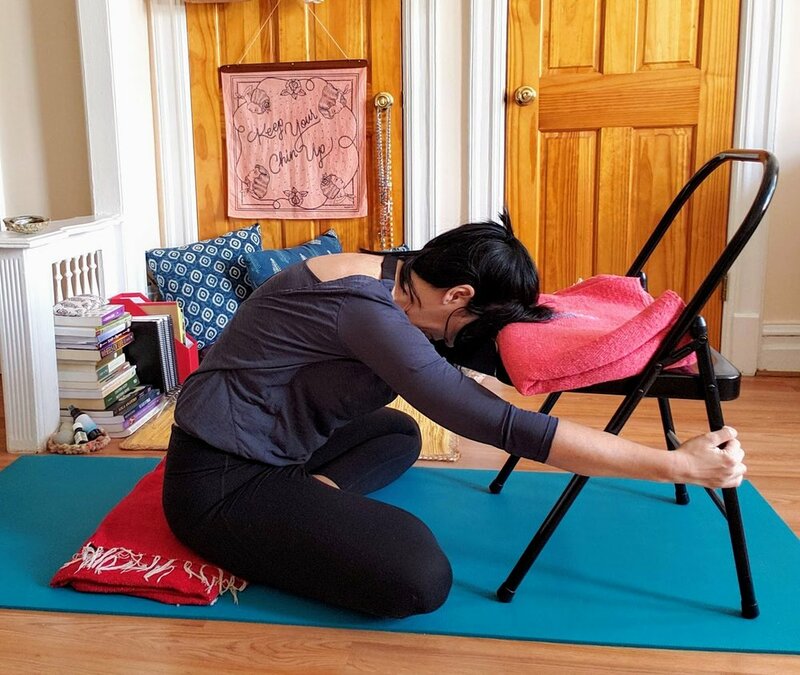 Prepare: Place your chair on your mat with the seat forward. Lay one folded blanket on the seat of the chair with the smooth folded side facing you. The second blanket is also folded into a rectangle. Place that as your seat with the smooth folded edge facing the chair. Come to sit on the edge of the folded blanket. Cross legs. (If crossing your legs is difficult, you can spread your legs apart into a V or keep the straight under the chair). Take an inhale and lengthen through your spine. Exhale and come forward so that the center of your forehead is on the blanket. If you need additional lift, place forehead on folded arms. Lift up from your hips and softly spread the upper back. Shape: Come to sit on the edge of the folded blanket. Cross legs. (If crossing your legs is difficult, you can spread your legs apart into a V or keep the straight under the chair). Take an inhale and lengthen through your spine. Exhale and come forward so that the center of your forehead is on the blanket. If you need additional lift, place forehead on folded arms. Lift up from your hips and softly spread the upper back. Practice: Make any adjustments necessary to ensure that you are comfortable. When ready to settle into pose, enjoy several long breaths to allow yourself to relax. Feel the support from the floor, or imagine mother earth below you. Relax, and deepen into this grounded feeling for 5 to 10 minutes. Change the cross of your legs and do another 5-10 minutes. Come to notice your breath. Take note of your inhales and exhales. No need to change your breathing pattern but just notice. Let go of the thoughts that enter your mind. If that becomes difficult, come back to noticing your breath. Forward folds are cooling so they are great to practice in the summer time heat. Relieves strain in back, neck, and tension headaches. This pose with the use of props is a great way to work up to the non-restorative version of this pose (shown below). Forward folds can be a challenge if you have tighter hamstrings or if you are just having a non-flexible day. Practice every day to loosen up your hamstrings, release tension in your hips, and work towards the a full fold. Grab the legs of the chair and extend your arms. Reach forward. Hinge at hips. Reach forward with chest. Release tension in hips. Rest forehead on mat or on a block. Take time to come up to an easy sitting pose. Stack your hands over your heart. Set an intention to stay aware of your breath when thoughts overwhelm you. Namaste.